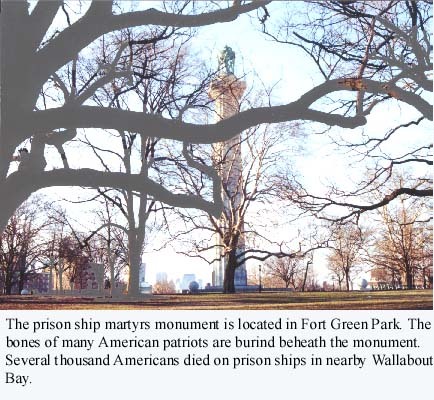 The greatest suffering in the cause of American liberty was endured in the prison ships in Wallabout Bay. Estimates of the dead from the prison ships exceed 11,000 -- nearly triple the 4,400 Americans who died in all the battles of the revolution. The Americans were taken prisoner during the Battle of Long Island, the retreat from New York, and especially at the fall of Fort Washington. Others were captured on ships. With the available buildings on land overflowing with prisoners, the British anchored old ships in the bay to serve as prisons. The Jersey, the most notorious ship, housed as many as 1,000 men. The starving and freezing men suffered from small pox and many other diseases. The Americans could obtain their freedom by pledging loyalty to the king. Few did. Each morning, the bodies were carried from the ship in burried in shallow trenches on the Brooklyn shore. 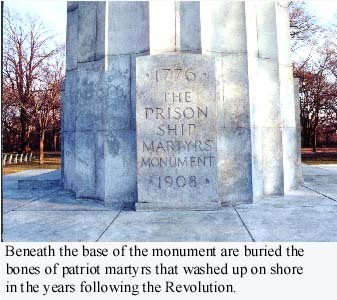 The martyrs are honored by a monument in nearby Fort Greene park. The park is itself the site of one of the forts the Americans had thrown up around Brooklyn Heights. The fortifications were abandoned when the Americans retreated to Manhattan. During the revolution, the star-shaped fort on this site was named for Israel Putnam, while a nearly identical Fort Greene was further south on Boerum Hill. During the war of 1812, Fort Putnam was rebuilt and given Greene's name. 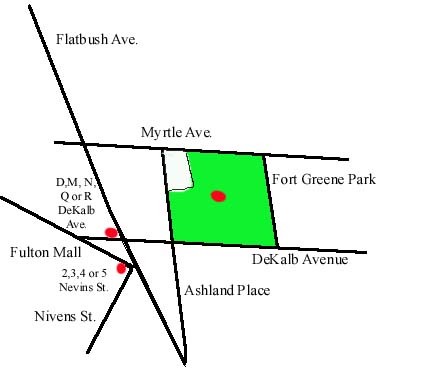 Address: Between Myrtle and DeKalb Avenues and Edward and Cumberland Streets.